Why Make The Devonshire Your London Base? Whether you’re in London as a visitor or for business, finding the right base is essential to ensure that you have quick and easy access to all the things you need for a stress-free experience. From nearby transport links to on-site dining and wellness facilities, you need to know that you have a welcoming and comfortable place to stay. That’s why the Devonshire Hotel London makes for the ideal place to stay on your visit to London, with everything on-site that you need for a centrally-located, relaxing and luxurious experience. With more 35-bedrooms on-site, The Devonshire Hotel London has different options available depending on your needs. Our Deluxe Double rooms offer Wi-Fi, a plasma screen TV and a sleek, marble bathrooms for the ultimate in modern luxury. If, however, you need a little more space, our Club Double rooms meet that need and come with the extra touches we know make your stay special. You can expect to find a welcome bottle of wine, fresh fruit and a daily evening turndown service – in addition to everything you’d find in a Double Deluxe room. For those travelling as a family or as part of a work group, the Deluxe Triple offers three plush single beds, a work desk, more wardrobe space and everything else you need for a comfortable, functional city base. As you might expect from one of the finest boutique hotels near Paddington Station, you have a range of options when it comes to the food and drinks on offer from The Devonshire. 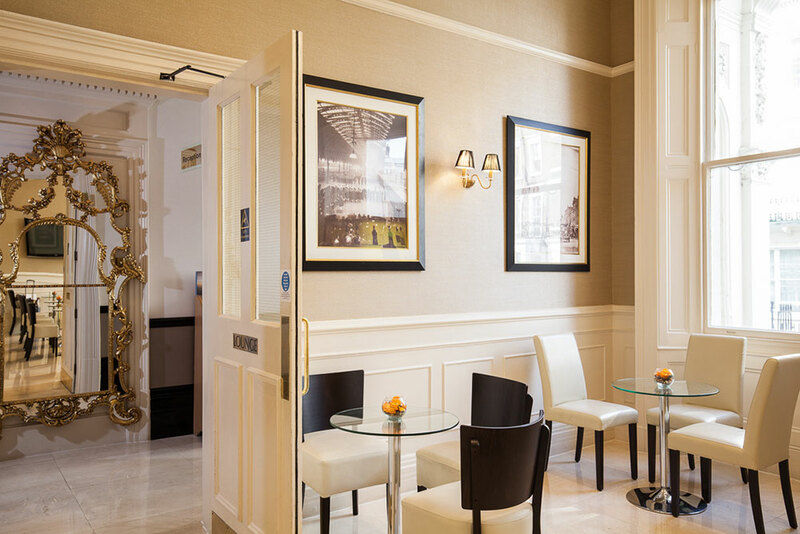 The Grand Restaurant – just across the street at our sister hotel the Park Grand Paddington Court – offers delicious and freshly prepared breakfasts for guests staying at The Devonshire Hotel London. Whether you prefer Continental Buffet Breakfast, a full English or our unique Indian Breakfast, The Grand Restaurant can provide what you need for the perfect start to your day. Or, if you desire a spot of lunch or dinner, that’s on the menu, too. When it comes to a late evening aperitif, the bar at our sister hotel features period looks for a refined, relaxing environment to mull over the day just gone. If it’s afternoon tea you’re looking for, you can find a full-on experience with all the trimmings – from finger sandwiches to indulgent pastries – at our sister hotel’s bar. If you want to work out the stress of the day, you can make full use of the thoroughly modern gym at the Park Grand Paddington Court – just a couple of minutes’ walk from The Devonshire Hotel London, enjoying complimentary access to everything on-site. If, however, you need a massage or other wellness treatments, a walk of a few minutes will take you to the spa facilities at The Devonshire. As well as offering an extensive range of rejuvenating treatments, you’ll also find a steam room, sauna and Jacuzzi style to create modern, relaxing surroundings.